You are here: Home / General Crafts / Wine and Slime Party – Because Slime is Fun for Adults, Too! 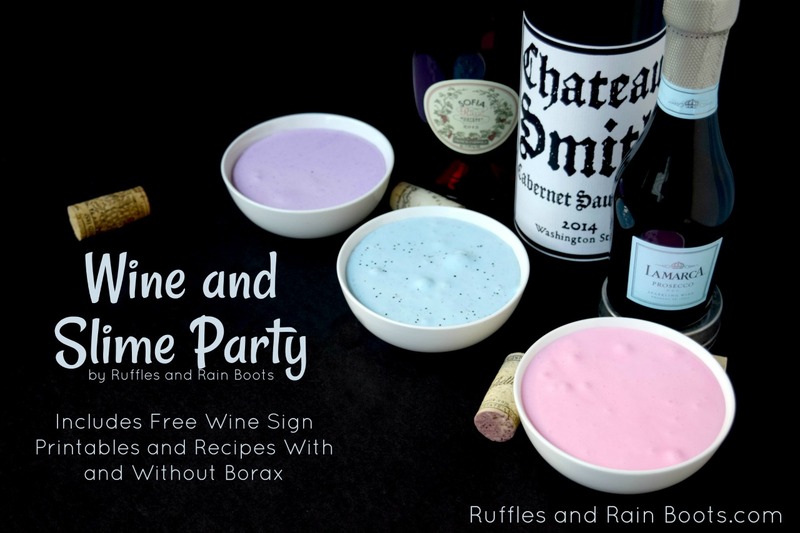 Wine and Slime Party – Because Slime is Fun for Adults, Too! Set up a wine and slime party – moms deserve to have fun with slime recipes, too! Slime recipes include slime made with Borax and slime made without and even wine tasting printables for your get together! 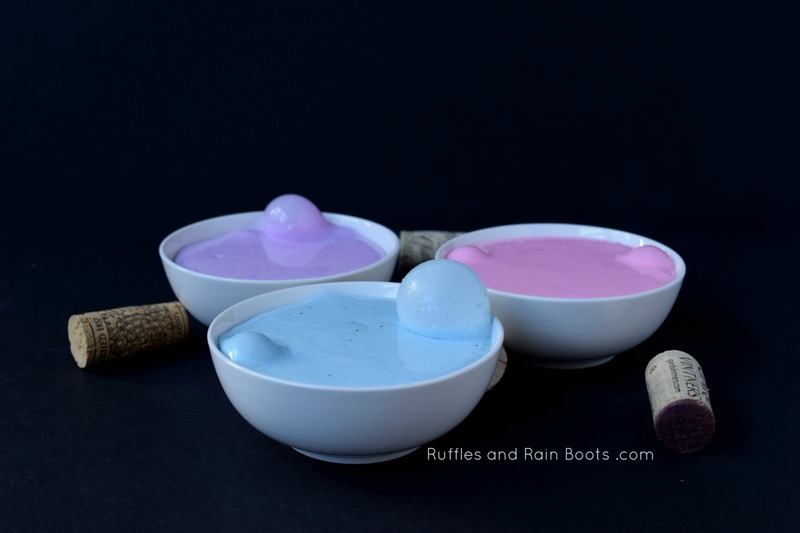 We love slime here on Ruffles and Rain Boots and have shared many of our favorite slime recipes with you here. Doesn’t this wine and slime party look like so much fun?! And just to ease fears, I have two recipes below (with Borax and without). Additionally, if you have a young child or anyone with sensitive skin, put the slime into a zip top bag and play with it that way. We did that for years with our daughter! Here is a quick video of how to make slime – it’s SO MUCH FUN to make and play with. Stir until you can’t anymore and really get your hands in there. It will take quite a few minutes to work it, so be patient. The slime, when forming, might fall apart or break off. Just add it back in and continue to work it with your hands. It will come together. Use small glitter (you can find kid-safe glitter online). The big, grainy glitter doesn’t blend as well. By now, you might have noticed the slime craze that started in 2016. Influencers on YouTube and Instagram went CRAZY for slime in all forms, textures, colors, and amounts. But there have also been those who question if using Borax is safe when kids (or adults who like wine and slime parties) touch it repeatedly. The answer: it is safe. Borax has a hazard rating of 1 – the same as baking soda and salt. It is not absorbed through the skin and even if consumed, it would take a LOT of it to do harm (like working in a borax mine). That being said, Borax can irritate sensitive skin. For young ones (or mouthers), put the slime in a sealed zipper bag for play. Note: if you see “borax-free slime recipes,” they will still need an activating agent (which will most likely contain sodium borate). DO NOT SUBSTITUTE LAUNDRY DETERGENT OR OTHER CHEMICALS IN SLIME RECIPES. 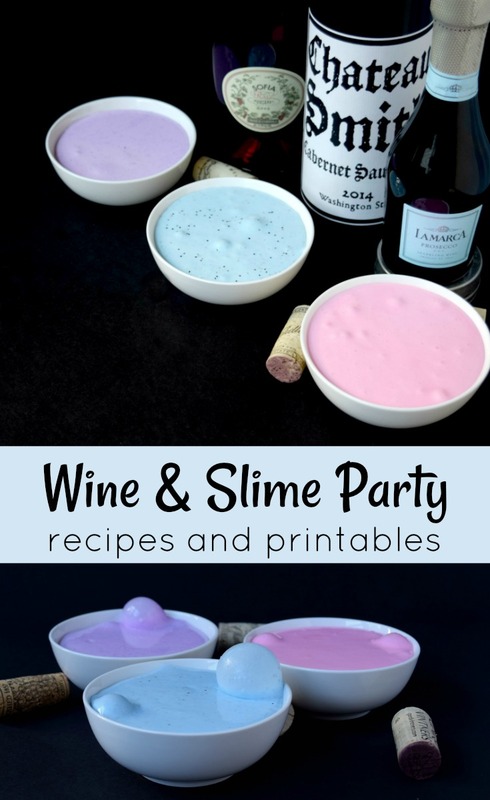 Set up a wine and slime party - moms deserve to have fun with slime recipes, too! Slime recipes include slime made with Borax and slime made without and even wine tasting printables for your get together! Empty glue in bowl. Fill the glue bottle with warm water, shake, and add to the glue. Add in the food coloring, incorporate well. Add in the shaving foam and mix until blended. Slowly add small amounts of the borax solution (or contact lens solution), stirring to incorporate. Once the mass has formed, mix for 5-10 minutes by hand. Add glitter, if using. Have fun! Empty the glue in bowl. Mix in coloring and spray the shaving cream on top. Incorporate fully. Add in contact lens solution until a mass forms and then work with your hands until no longer sticky. Dump in some glitter, if using. Have fun! For a gallon of glue-sized slime recipe, visit this easy 3 ingredient fluffy slime post. While the little ones (and the adults) are making slime, go on a tour of some relaxing wines! It wouldn’t be a wine and slime party without the wine, or at least, it wouldn’t be a very good one. I’ve created a bunch of fun table tent cards for you to set up a tasting. Have everyone in the neighborhood bring a single bottle of wine and enjoy! 6 Place Cards (Table Tents) – just print and fold on one line and you’re done! Let’s just face it – we should get to enjoy this stuff, too! 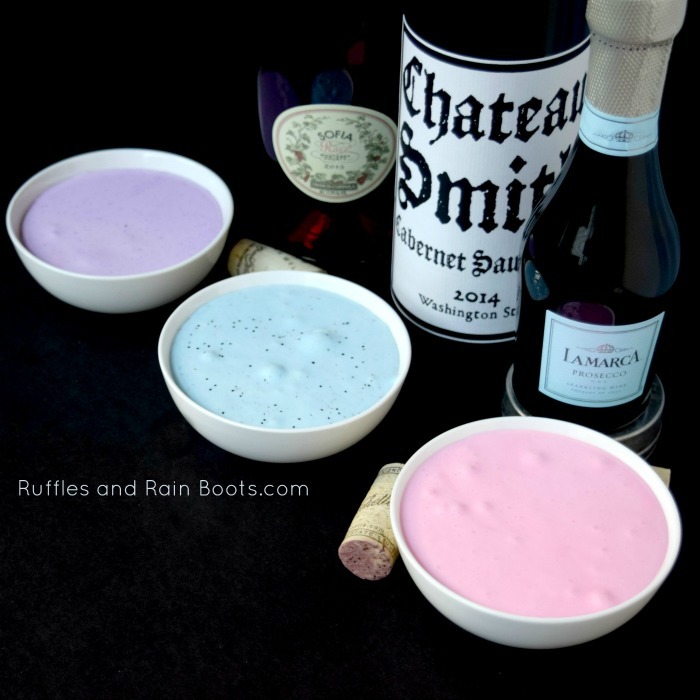 Share this fun wine and slime party idea. Best slime post E V E R!